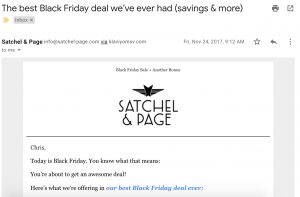 Last year I worked on a few Black Friday/Cyber Monday email sequences for two clients of mine. Both clients reported back that they tripled sales from the previous year… and both made a touch over $60,000 in sales, each. Which was kind of weird. But hey… I’m not gonna argue/complain about those results. The Most Profitable Week of The Year? If you own a business, you OBVIOUSLY need to have an awesome promotion for Black Friday/Cyber Monday. It’s like shooting fish in a barrel with a rocket launcher. The people on your email list have their credit cards laid out, next to their laptops… and are DYING to spend money. And while it’s easy to make sales just blasting out a few emails, there are some “buying triggers” you can pull to really make this week the most profitable week of your entire year. Before I show you the sequence, please keep in mind that I have no idea how much you are going to make if you run this. It depends on your products, your market, your relationship with your list and your offers… among a whole slew of other factors. But if you have a decent sized list and products that people actually want to buy… you could probably make a killing. It’s kind of like a four-day cash machine, which is one of Frank Kern’s creations… who’s stuff I absolutely love. The principles behind it are pretty simple. Set a time limit/expiration date. Offer a bunch of valuable bonuses which disappear after the deadline. Send multiple emails about it. It’s truly idiot proof. And if you just did this, it would work wonders. However, I’ve kind of created my own little version of this sequence for my clients. And instead of just sticking to four days and four emails, I’ve found there are a few ways to make it even better depending on your offer. The most important thing in this promotion is crafting a good offer. Add in bonuses just for this promotion that disappear once it ends. Add a unit, inventory or enrollment limit. Maybe you only want to offer this to the first 100 or 200 people. Maybe that’s all you have in stock or maybe you just want to offer this to a small group of fast action takers. Just make sure it’s real scarcity. And cut it off when you say you will. You can mix and match these persuasion triggers. You can use all of them or just one or two of them. It’s your offer. Your sale. You decide what works for you. But the more you have, the more compelling it will be. Over the course of these five days, you’re going to send 7 emails. This email has no link. There is nothing to click. There is just a heartfelt message from you thanking them for always being a loyal friend who always reads your emails (hit Cialdini’s consistency trigger here). Make it real and make it come from the heart. Make it look and feel like a one-to-one convo. At the end of the email, or even in the P.S. just let them know that tomorrow is going to be one of the biggest sales you’ve ever had in company history. This email is where you spell out the details of the sale. Now, you have a choice here. If you can do that, the copy on your lander will take care of everything else. Tell them that this sale is for Black Friday. You don’t have to mention anything about the next few days — they’ll find out tomorrow. Today, you’re going to tell them that you’re extending the sale all the way to Monday. Tell them how much of a big success it has been (social proof), maybe include a customer review (if you have one already), and then reiterate the details of the sale again. List out all the discount, bonuses and scarcity for them again. Then, finish up by letting them know the deadline is Monday at midnight. Today, you reiterate the details of the sale. Tell them again about the bonuses. Tell them again about the scarcity. Let them know that it ends tomorrow at midnight. And if you so please, you might even want to up the ante for Cyber Monday and add in a special bonus that you’ll reveal tomorrow — but you don’t have to. Just another idea for you. Simple, straightforward, to the point. Now it’s time to get crazy. Push the scarcity buttons here. Hammer home the scarcity and urgency of the offer. Maybe even handle an objection or two. This should be your biggest day of sales. You don’t have to be a master wordsmith here. Just be clear and explain the details of the sale. If you already have products that people want, they will be receptive and will open their wallets for you. They are already in a buying mood. They already told themselves, in their mind, that they are going to spend money this weekend when all the sales hit. Ride that wave all the way to the bank. As you can see, there is a heightened sense of awareness… so we don’t need a riveting story or a super copy heavy email. We just need to sell the damn thing. We very clearly spell out the awesomeness of the deal… and state the limits/urgency of the offer. We were giving a different bonus out each day for the first X people who bought an item over a certain cart value. That’s another useful tactic that worked well. Not a lot of storytelling or any of that nonsense. 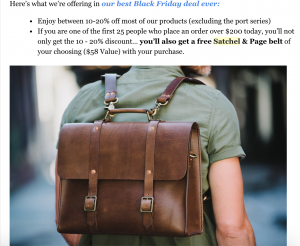 Want Some Help With Your Black Friday/Cyber Monday Email Sequence? Yes… these sequences aren’t terribly difficult to write. And you could probably bang out a halfway decent one on your own. But the real magic with these promotions is strengthening the offer to a point where people find it very hard not to take advantage of your deal. That’s where most people leave money on the table. If you’d like some help with your Black Friday/Cyber Monday email promotion… and want to make more sales in one week than you’ve made in the last 3 months… then head on over to my Work With Me page and fill out the application on that page. CLICK HERE to have me help you craft a super profitable Black Friday/Cyber Monday email sequence for your business. 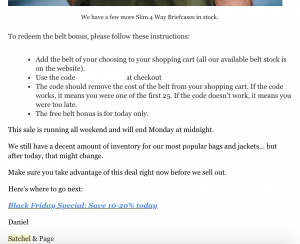 If you found this article useful, please send it to a business owner who wants a simple formula they can follow to crush their Black Friday/Cyber Monday promotion. Thanks Chris!! Love the content you are putting out. Thank you Ali… I will keep trying my best. Planning on implementing some of these for a promotion we have coming up this month. Thanks Kelan… keep me posted with how it goes. You should crush it. Chris, thanks so much for this! I’m a new subscriber and I’m just amazed at how generous you are with information. Thanks so much! I just implemented this and scheduled it for the dates and times you suggested. Crossing my fingers that I get some sales. Keep me posted with how it goes!